Whether we are installing an epoxy garage floor coating or an industrial floor coating, we deliver superior customer service and only the best epoxy products formulated for longevity and durability. We make it easy to customize your epoxy coating based on your design, safety, and performance needs with a dedication to delivering epoxy products that exceed your expectations. What Are Concrete Epoxy Coatings? While it’s applied as a liquid like paint, an epoxy coating is actually an incredibly resilient floor system made from a combination of hardener and resin. As these compounds mix, they react chemically to form a rigid plastic material that bonds with the concrete substrate and withstands even heavy abuse for years. Epoxy floor coatings in Austin, TX are the commonly used in demanding industrial and commercial applications but they can be decorative enough for use in homes and garages. You have never had more options when it comes to flooring for a commercial property, industrial facility, or home garage. With so many options on the market today, how do you know which is right for you? Here’s what an epoxy floor coating has to offer and why it’s a perfect fit for so many applications. Epoxy coatings for concrete floors in Austin don’t require special adhesives or cutting to install. Once your concrete is prepped, a professional epoxy floor coating is easy to install and cures into an ultra-durable surface. We offer fast-cure formulas for commercial properties and we can work around your schedule to eliminate costly facility shutdown. A quality epoxy coating creates an ultra-bright and high-gloss surface that instantly brightens interior spaces by up to 300%. This can be especially helpful in dark areas like a garage or areas that require excellent lighting and visibility for safety such as hospitals, hangars, and factories. It isn’t easy to damage an epoxy floor coating. Once fully cured, epoxy creates a hard plastic coating that withstands constant traffic and wear. It can resist water, oil stains, and chemical spills as well as forklift traffic, cart wheels, and more. The hard-wearing surface of epoxy maintains its clean, professional look for years. Professional epoxy floor coatings in Austin don’t require much maintenance at all to maintain a bright, stain-free, and resilient surface. You don’t need to wax or polish the floor or worry about using special cleaning products to avoid damage. Simply sweep and mop as needed. Industrial and commercial epoxy floor coatings can even be pressure washed with cove base protection. Want a durable, attractive, and long-lasting floor system without spending a fortune? It may sound too good to be true but it’s possible when you invest in an industrial-grade epoxy floor coating in Austin, TX. An epoxy garage floor coating can cost less than $5 per square foot depending on the decorative options you choose yet last up to 20 years with little care. The last thing you want to do is invest in a beautiful epoxy coating only for it to fail within a few years. DIY garage epoxy kits usually only last 1-2 years and require annual recoating. Our industrial-grade epoxy coatings for concrete floors last up to 20 years in many applications and even up to a decade in commercial settings thanks to thorough concrete prep and superior 100% solids epoxy products. An epoxy floor coating in Austin is a USDA approved floor system that’s seamless and nonporous. It prevents chemicals and more from leaking into the concrete and isolates spills so they can be cleaned up easily. With its seamless and hard-working surface, it’s easy to maintain and sanitize even to hospital, restaurant, and food processing standards. Epoxy floor coatings are highly customizable no matter what look you’re going for: elegant and sophisticated, fun and colorful, dramatic, or sharp and professional. A sleek, single color epoxy coating creates a showroom look while granite flake epoxy offers understated design and depth. Our epoxy coating contractors can even create custom one-of-a-kind designs for your floor to create a showpiece for your hotel lobby, bar, store, medical center, or anywhere else. One of the most dramatic looks we can achieve is a metallic epoxy floor coating which has a 3D effect with depth and movement to look like colored glass, rippling water, molten metal, or anything else you can imagine. An epoxy coating in Austin, Texas needs a porous, clean, and smooth concrete surface for strong adhesion. Before we apply a professional epoxy floor coating, it’s crucial that your concrete be prepared or your epoxy will fail prematurely. We take the time to repair and patch damage like chips, cracks, and spalling in the concrete and remove grease or oil stains. Old concrete will also be tested for old layers of products that may have been applied like epoxy and sealers that can interfere with bonding. Another important step in preparing your concrete is diamond grinding, which involves grinding the top layers of the concrete with diamond-coated pads to smooth away imperfections, open the pores of the concrete, and profile the surface. This creates a smooth, porous surface that’s ideal for an epoxy installation. One of the most popular applications for epoxy is a garage epoxy coating. 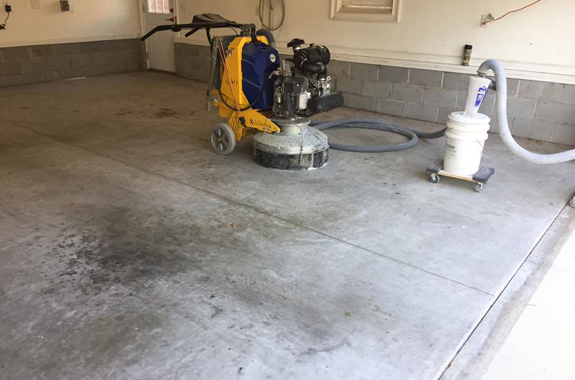 Our epoxy coating contractors in Austin can stop concrete dusting and give you a beautiful, seamless, and hardworking garage floor that lasts up to 20 years in the face of gas and oil spills, hot tires, moisture, and more. Imagine the possibilities with a showroom quality garage floor or a metallic epoxy floor coating that gives your garage a real “wow” factor! Epoxy garage floor coatings may account for a large share of our business but epoxy flooring was created for commercial purposes. A commercial epoxy floor coating in Austin, TX is an ideal floor system for almost any environment that requires a durable, seamless, and safe floor. Our epoxy coatings for concrete floors are slip-resistant and decorative enough for public areas yet remain resistant to damage from shopping cart wheels, forklift traffic, chemical spills, extreme temperatures, moisture, and more. With its low installation cost and long life, a commercial epoxy coating is the ultimate floor system with a low lifecycle cost and minimal maintenance required to maintain its performance and appearance.